Hands up for those who, like me, take care of their feet not as often as we should. Yes I can see a lots of hands up (including mine) well let's talk about those forgotten feet ladies, shall we? Why, you might say, well to start with they support our weight all day long, they are sometimes squeezed into uncomfortable shoes such as high heels or hidden away in tight shoes. Often when I look at my feet I feel sorry for them as much as I take care of the rest of my body my feet seem to be the least of my worries. Lately I got the amazing opportunity to try a pedicure set. 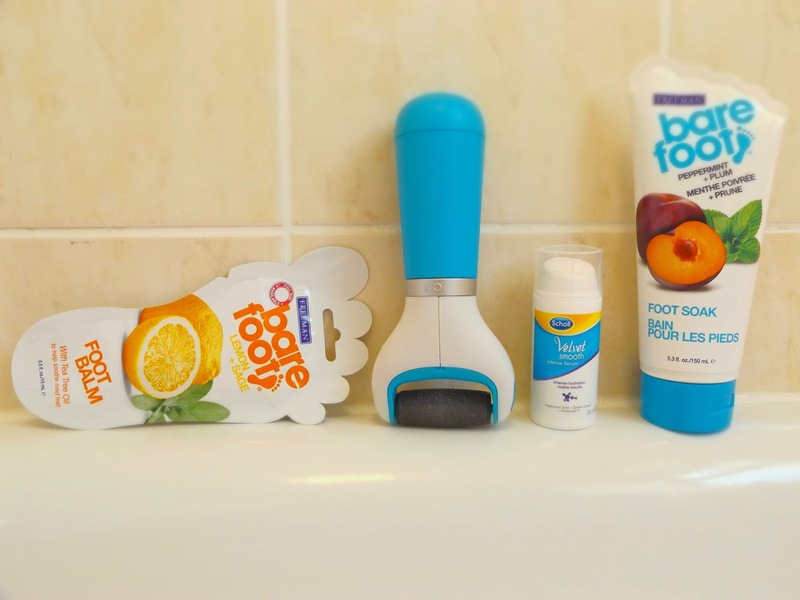 The set included an Scholl electronic foot file, a Scholl velvet smooth serum, a Bare Foot balm and a Bare Foot soak. I was very excited and intrigued to start my new feet regime by using the Electronic foot file. I've used it a couple of minutes on each foot for the past 3 days now, before showering, and I can already see an improvement. I think this type of product are to be used for many days before seeing a result but it definitely works and I am actually very happy to have this product in my bathroom cabinet now, I just regret I didn't have it any sooner. My feet are definitely smoother especially around my heels which is were my skin is the hardest and drier. Honestly I strongly recommend it, also it's much cheaper than getting a pedicure and so easy to use. 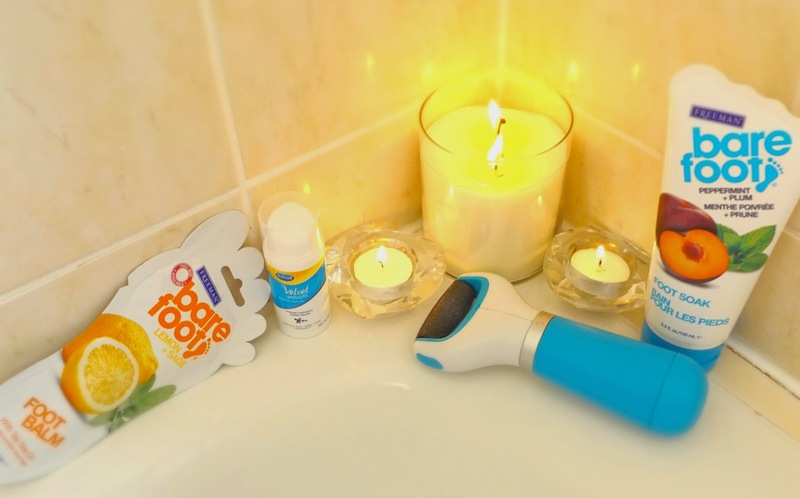 My two second favourite products are the Bare Foot Soak and the Velvet Smooth serum, this one has been used after every electric smooth section or after my shower. Like a serum it hydrated my feet very nicely the product is very light, translucent, penetrates very quickly, does not leave a greasy residue and has a lovely rose smell. I am not too sure if it is actually a rose scent but it does remind me of this flower so there you have it. Also I am loving the bare Foot Soak, mostly because it just smell so good!!! The scent I have is peppermint and plum but I think the plum scent is more present than the peppermint and the colour is purple! I love purple feet bath. Honestly I even would love is this product if it came as a normal shower gel because it smells so good. As I don't have a large enough bowl to deep my feet in I have just left enough water in my bath tub to cover my feet then I add a good amount of the bare Foot Soak and I sit on the corner of my bath tub while dipping my feet in! I only do that for like 5 or 8 minutes before I shower. I really enjoyed it, very relaxing too, I probably wont do it every day but I think after a long days work or after running or a long walk this could be very welcoming. Last but not least I also tried for you Bare Foot Balm, also a winner, this product is more thick than the serum but never the less still as good, the only thing is that I am not loving the lemon + sage scent mix along with tea tree oil, I think I would prefer just lemon + tea tree oil but I guess this is just my taste. Overall this balm is lovely to use, also it penetrates quickly and it feel like your skin have been very nourished and it come in a single use packet, so have a go ladies. It's worth a try. I 'll be honest with you a week ago I would have passed though the feet range at Superdrug without even looking at it but I can ensure you that the next time I go to Superdrug I'll definitely check out their feet section and I'll probably be very happy to purchase the Bare Foot soak and also the balm.